Happy 54th birthday to Tony Phillips, a guy who exceeded the common definitions of "journeyman" and "utility player." He suited up for six franchises over 18 years, played every non-battery position, and posted a 109 career OPS+, drawing 100+ walks five times. Stealing a page from Satchel Paige's playbook, Tony prolonged his career with independent teams Yuma Scorpions (2011) and Edinburg Roadrunners (2012), then tried out for this year's York Revolution. Unlike former big-leaguer Brett Tomko, Tony didn't make their 2013 roster. I like the photo on this card's front exactly as much as I dislike the card's cluttered, mis-mash back. 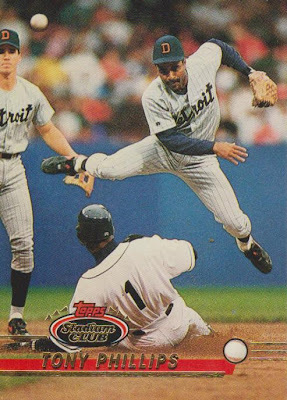 The fuzzy glove hand obscures almost everything else and Stadium Club would've been better served choosing a rookie card OR batting pose and not both. It's interesting that Topps called Tony "3B-2B," given this breakdown of where he played in 1992. Given all that, I'd go with "2B-OF." Tony's fielding versatility reminds me of Pete Rose, as Charlie Hustle logged 500+ games at 5 positions. 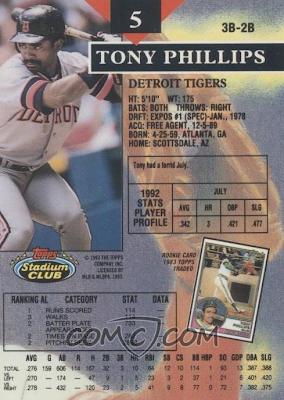 It's almost certainly why Phillips never made an All-Star team in 2 decades of good play. Value: Tony's star never rose high enough in the sky to break $1, but I bet he enjoyed the 1989 World Series win.